In today’s world, to remain competitive, digital marketing is a necessity. To a small business owner, though, digital marketing may seem intimidating. Many see it as being expensive or feel it’s too complex to navigate. Both of these are not true! There’s tons of free, easy to use tactics small businesses could and should be using to market themselves. As we go into 2017, there are 3 main marketing essentials that small businesses cannot ignore. All three are either free (or cheap!) and are good places to start if you are behind on digital marketing for your business. The easiest of them all! The point of a mass email send out is to remind people of your brand. All that’s required is pulling together a list of recipients. These can come from QuickBooks or any database you may have of client information. You can also add to that list by providing a sign up form on your documents, website, or social media! You can also pay different companies to compile a list for you if you want to target prospective clients. Upload the list to services such as MailChimp to make send out that much easier. What you send out is completely up to you! For example, you can send out a monthly or weekly newsletter to keep people updated on relevant company information. Search engine optimization (SEO) lets your website’s content be discovered through search engines. There’s tons of factors that play into where and how your business will rank amongst competitors. What’s most important is the keywords you choose to use. You want people to link back to your website (organically), so it’s important you use keywords so that other websites can find you in the first place! A good place to apply keywords is through blogging. This is assuming your small business is already on social media (Spoiler alert- you should be!). You probably are already sharing external content, but its important to find a balance between external and internal. Telling people about your services, upcoming deals, or other information should be happening in a fun way. You want people to share your content with their friends, so making something that is relatable is also important! If you aren’t a design wizard, sites such as Canva are there to help you for free! 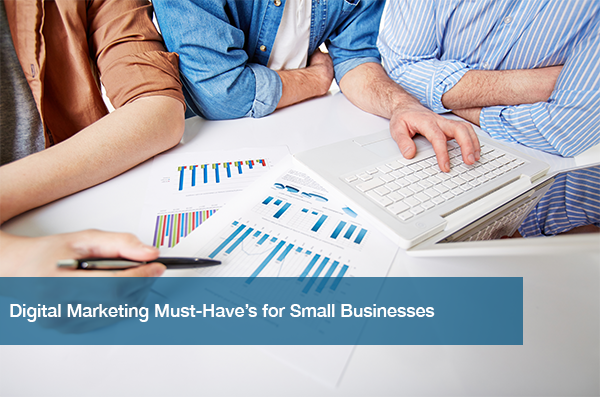 There are so many other digital marketing must-have’s for small businesses. But, it’s important to have a solid starting place. Once you are comfortable with the three mentioned above, it’ll make any other marketing strategy a piece of cake! Before you begin marketing, it’s important that you understand your business’ brand. If that’s something you’re still working on, no worries. Be sure to check out our post on The Importance of Branding for Small Businesses for guidance.